Lately, I have been thinking about culture and faith. I just finished perusing Leviticus and am journeying again through Numbers. These two Old Testament books, perhaps more than other parts of the Bible, are challenging to read, understand, and apply. The meticulous law, the priesthood rituals, and the early history of the Israelites can seem archaic, mundane, and irrelevant. However, I am discovering how much the Pentateuch (the first five books of the Bible) emphasizes God’s desire for holiness. Holiness is to be set apart. It is to be separate from the world. However, holiness is not a call to negligence or isolationism. On the contrary, Gid commands His people to love and care for others – to be involved in enacting justice. In the 21st century, caring about social justice issues has become popular. It is more than trendy; it is the norm. Moreover, it is expected of millennials to show interest in social justice issues. There are numerous human rights organizations that are fighting poverty and striving to meet the needs of the marginalized through humanitarianism. It is encouraging to see believers and nonbelievers alike responding to these issues. Just as holiness is central to the character of God, caring for the hungry, hurting, and broken is close to His heart. This has caused me to think about how Christians are part of this culture but distinguished within it. 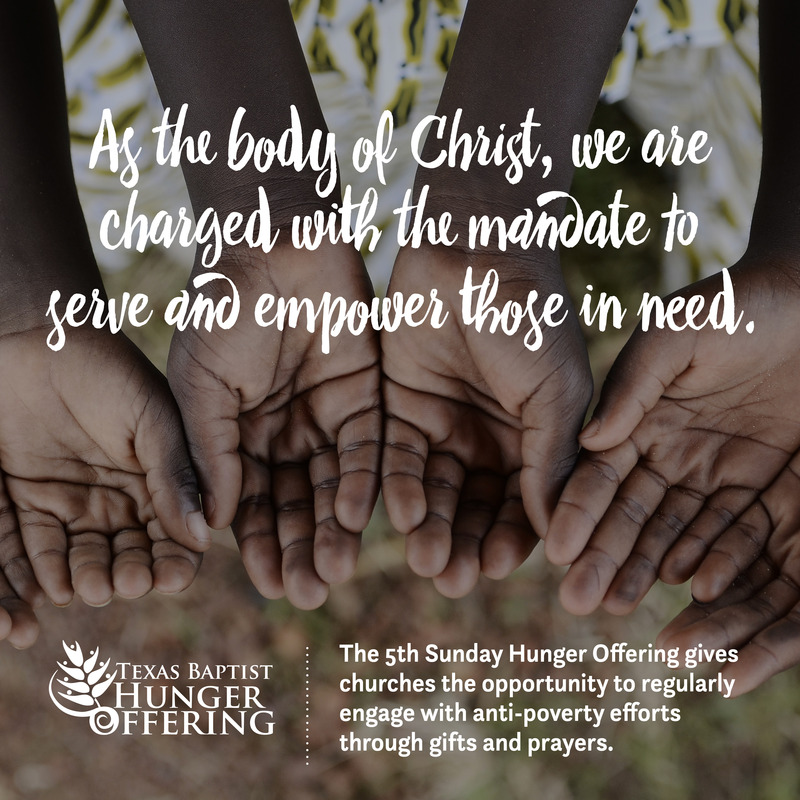 Both the motives and implementation of efforts like the Texas Baptist Hunger Offering are different from secular humanitarian organizations. The church’s motivations for serving others and giving should be anchored in love, faith, and obedience. The more Christ-like Christians become, the more natural it is to be actively involved in social justice. Jesus is the epitome of love – sacrificial love. This drives the church to give generously and sacrificially, without expectation of gain. The Scriptures are clear that good works are a product of faith. Works do not save, but they are a mark of the saved. Obedience to God’s commands is also a motivation to give and serve. Old and New Testament Scriptures alike are laced with examples, exhortations, and instructions to serve those in need. Finally, the manifestation of these motivations looks different than the world’s because it testifies of Christ and brings Him glory. I am thankful that Hunger Offering ministries serve others in the name of Christ and address both physical and spiritual hunger needs. As you think about your own response to social justice issues, I encourage you to consider becoming involved in the next 5th Sunday Offering on July 30. This is an excellent opportunity to do justice and love kindness. You can give online anytime here.